Make your bathrooms more of a personal space by choosing from various colors and shades tiles to design tiles and more. For flooring I would suggest home owners to opt for dark colors like navy blue, browns, etc. But avoid using black. And for bathroom walls, home owners can choose from a variety of lighter shades from creams to blues to purples and more. For better bathroom interiors, home owner can have a combination of design tiles and colored tiles. For flooring prefer buying buy size tiles like 2’x2’ or 3’x3’. Having big tiles will result in lesser tile joints that will make the bathroom flooring look neater. Smaller tiles will have more tile joints that makes the room look untidy. For bathroom walls, is 2’x1’ is ideal tile size. The wastage will also be nominal with this tile size. There are two basic tile finishes available i.e. Glossy finish and Matt finish. For bathrooms Matt finish tiles or Semi-gloss finish tile which is 50% glossy and 50% matt finish are ideal choice. These finish tiles are usually used for wall application. For flooring home owners shall only and only buy anti-skid tiles. Bathrooms are usually wet, these anti-skid tiles will prevent from slipping. If you are buying design or pattern tiles we suggest you to buy Italian finish tiles to make you bathroom interiors more trendy and smart. Before choosing design or patterned tiles, one very basic info that every home owner shall be aware of the wastage percentage of the design tile chosen. While installing design tiles additional care needs to be taken since the design of each tile needs to match with adjacent one. And due to this there’s quite a lot tile wastage observed. For example- If a home owner happens to choose a difficult design like wave design tile. During application the design of each tile needs to match the adjacent tile otherwise the design will have no importance. To match the wave pattern of tiles it is cut due to which there’s loads of wastage. The wastage percentage will vary with tile pattern/ design. For few design the cut part of the tile can be used vertically or horizontally for corners. No dealer or shopkeeper will acknowledge a home owner with these details unless and until asked for. Therefore it’s important for a home owner to know the wastage percentage for the tile design/pattern chosen by him. There are these highlighter tiles that are available in both plain color and pattern too. 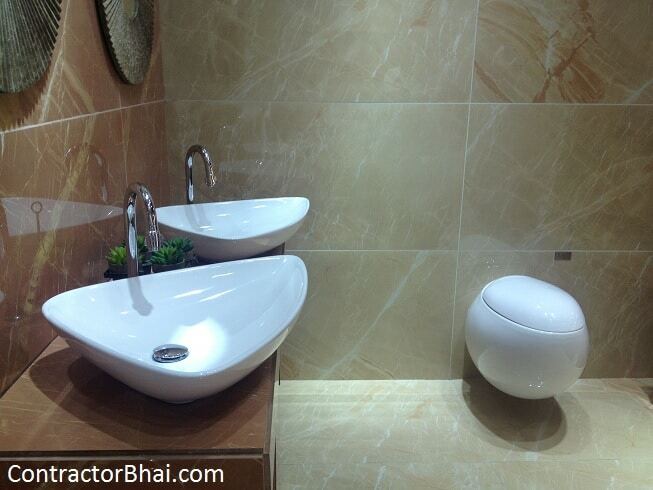 Home owners can choose from these as per their choice and style of bathroom. But home owners shall take care of not over doing bathroom with highlighter tile orelse the interiors will appear to be too loud. Usually a ratio of 20-80 is maintained where 20% highlighter tiles and 80% other tile is used. TO add to visual interest, home owners can use alternate colored tiles for different areas like different for shower area, WC area and basin area. Similarly home owners can have different combination of wall tiles to make their bathrooms smarter and trendier. To make your bathroom and better place, you can contact out contractorbhai.com team to help you choose appropriate design, size and color tiles for your bathrooms.